Guess what…..?!? I got nominated for an award and it’s my first one! The Versatile Blogger Award!! Not sure if it is some kind of chain letter type blog award but I am honored even if it is. I would like to thank @SunshineMommy & @ItsADomeLife for nominating me for this award. These two women are amazing bloggers and you need to check out their sites! Thank the blogger who nominated you and include a link to their site. Nominate 15 bloggers that you’ve recently discovered or follow regularly and include a link to their site. Let the other Bloggers know that you have nominated them. I love taking pictures with my iPhone and posting on Instagram. I talk baby talk to my dog but never did with my daughter. I make the worlds best home fries and Beef Stroganoff. Definitely my favorite word is definitely. I buy art supplies every chance I get but never seem to have time to use them. 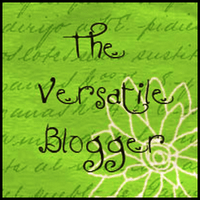 I Nominate the Following Bloggers for the Versatile Blogger Award. These are all wonderful bloggers and I read their blogs every chance I get… so follow them and show the love! Thank you so much 🙂 🙂 What a fun thing to see this morning. I really appreciate it!! Your welcome! You deserve it! You are such a dear!!! Thank you, my friend!! Your welcome and it is well deserved! Thanks, sweets! It’s always nice to be recognized by a fellow blogger! Can’t wait to have a little time to check out your 15! Thank you for having such an awesome blog! I definitely think you should definitely make us some home fries. Your husband sounds like a keeper. Thanks for sharing your most admired blogs with us! Your welcome and I will work on posting those recipes! Thank you!! I definitely agree with It’s a Dome Life, you definitely need to shard that receipe with us. For sure. Definitely. Yes, I defitely know I’m being annoying! Thanks again for the kind words and award! A girl after my own heart! I have to watch myself on language…. my daughter takes after me way too much. Definitely!